The iMonnit Online Wireless Sensor Monitoring System has a new “self-registration” feature which allows users to register their own accounts and create their own wireless sensors. In the past, Monnit’s fulfillment staff entered in all your account information prior to shipping the kit. We chose the username, the password, and all of the user and account information. To give the user more flexibility, we now have a self-registration process. If you decide at the last minute to send the sensor network to someone in another location or facility, they’re not stuck with a predefined user login and account information Monnit set-up before the product shipped. This also increases convenience for our reseller partners. No longer will they need to set-up a customer’s account prior to shipping the product and transfer sensor networks parked on their master account. Monnit ships tested, unregistered product that is inventoried. When a customer places their order, pull inventory from the shelf, box and ship. The customer takes the information included in the Quick Start Guides and the ID information from the sensors and gateways, creates an account under the reseller master account (through a reseller branded login site) and logs in. Simple. This past month we have been receiving a lot of calls requesting our wireless temperature and water sensors for use in both commercial and residential properties to help minimize the potential for damage due to frozen water pipes. Did you know that when water freezes it expands putting pressure on pipes, valves, tubing, and hoses. The result is often costly and very time consuming to fix. In a matter of minutes a one-eighth inch crack can release 250 gallons of water and disrupt your life in ways you never imagined. It is always smart to insulate pipes that are exposed and where possible, turn off water lines and drain pipes that are not in use. However, these precautions are not always feasible and do not always work. So, how can you make sure that your pipes don’t reach freezing temperature? How can you know if there has been a water pipe break? 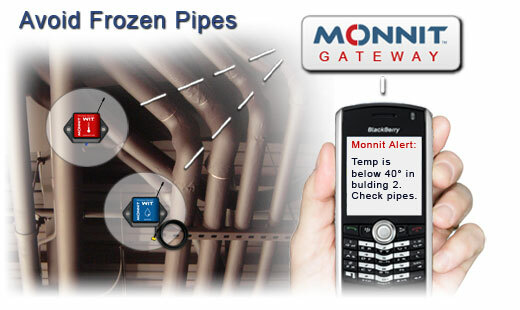 Using Monnit’s affordable wireless temperature sensors and wireless water sensors allows you to monitor the temperatures of your water pipes and know immediately if there is a broken pipe leaking. Place these sensors in your basement, attic, crawl spaces or even outdoor areas to know exactly what the temperature is. There are no wires to worry about, and the setup process is amazingly simple. « View More Information. Enjoy the winter season without worrying about the potential damage of broken water pipes. To calibrate the light sensor, put the sensor in the area where you want to monitor for light presence. Make sure the light level is where you want it in the area because when you calibrate the sensor, it will consider that level as light, and anything less than that level as dark. 1. Login to your iMonnit account with the credentials provided. 2. Select the “Light Presence” sensor from your sensor list. 3. Click on the “Calibrate” tab in the main sensor window. 4. With the sensor online, place it where you want it and set your light level. 6. Wait for your sensor to check-in again for the settings to take place.